New Delhi, October 2017: With a purpose to provide an excellent platform for the promotion of Korean studies in India, Researchers’ Association For the Study of Korea (RASK) organized All India 11th RASK International Seminar at the Conference Hall, Jamia Millia Islamia here. 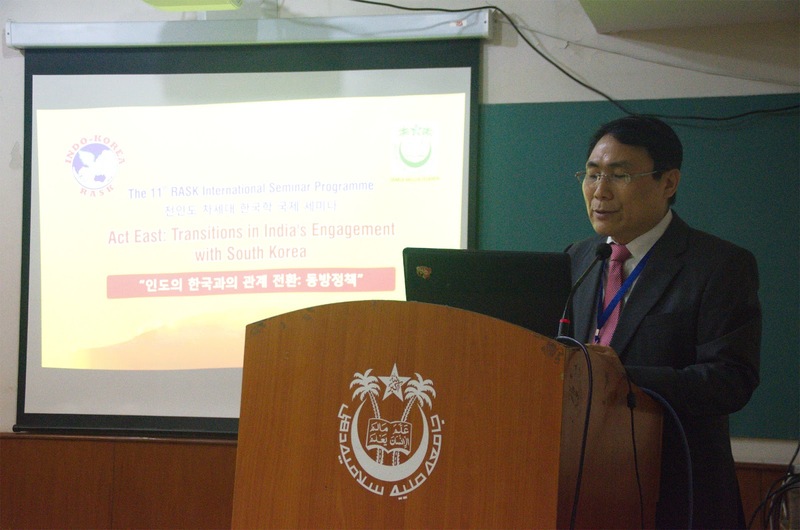 The theme of the seminar was “Act East: Transitions in India’s Engagement with South Korea”, where scholars from eminent Universities of India and Korea participated and shared their experiences and research papers. In this seminar a number of excellent papers were presented on different themes. The main objective of the seminar is to provide a platform to bring the scholars to present their understanding and experiences related to Indo-Korean relationship and to enrich their knowledge by learning from one another. This seminar reflected a variety of perspectives as it has contributions from scholars from various fields of Social Sciences and Humanities. The views and observations through this conference contributed to enrich future literature on the following areas: (1) Politics & International relations, (2) Economy and trade, (3) History & Society, (4) Education, Culture & Religion, (5) Language & Literature, (6) Environment and Disaster Management, (7) Computer and Information Technology. The seminar will include various discussions and debates not on based on India and South Korea but also include current security focused issues related to North Korea, China and overall North East Asian region. The seminar is having the eminent scholar and former foreign minister of South Korea, Yoon Young Kwan, who will talk about ‘The problem of North Korea’. During the seminar a book “India-Korea Relations: Forging a Multidimensional Partnership” edited by Prof. Sushila Narsimhan & Prof. Kim Do-young was also released by the dignitaries. 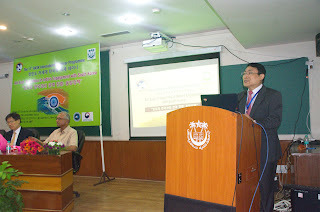 The two day 11th RASK International Conference was supported by The Academy of Korean Studies, Embassy of the Republic of Korea in India ,Prof. Talat Ahmad (Vice Chancellor, Jamia Millia Islamia), Prof. Kapil Kapoor (Chancellor, Mahatma Gandhi Antarrashtriya Hindi Vishwavidhyalaya), Ms. Park So-yeon (Counselor, the Embassy of the Republic of Korea) and Mr. Skand Tayal (former ambassador to S. Korea) etc. While Prof. Yoon Young-kwan (Former Foreign Minister of the Republic of Korea), Professor Emeritus (International Political Economy, Seoul National University) presented the keynote address. The sessions were chaired by some of the renowned personalities, Prof. Doraiswami (Dean, International Studies), Prof. Khan Masood Ahmad, JMI (Former vice-chancellor of Khwaja Moinuddin Chisti Urdu, Arabic-Farsi University), Prof. Mukesh Ranjan (Coordinator of International Relations), Prof. Ilyas Hussain (Dean, Faculty of Education of JMI), Prof. Sushila Narsimhan (Editor- in- Chief of RASK) and Prof. R.B. Singh (Professor of Geography, Delhi School of Economics, Delhi University). A special tribute to Prof. Kim Do-young who has devoted his full energy and soul in the preparation of the Conference and the Korean Studies programme in India was also applauded by all. Researchers’ Association for the Study of Korea (RASK) is a formal association which aims at bringing researchers from India and Korea together to share their research and learn from one another. A special emphasis has been put on the area where India and Korea have been cooperating or having strong potential to learn from each other ranging from culture and philosophy to science and economics. India and Korea have been known to each other from early history in the form of Buddhism. In more contemporary times, with the liberalization of Indian economy, both the countries have identified several areas in which their complementarities will make bilateral cooperation fruitful and promising in future and promising in future. The aim of the association is also to make an assessment of India-Korea relationship and to bring the people from the higher academic world at one platform and comprehend the bigger and wide picture of bilateral cooperation. Evaluated with excellence by the Academy of Korean Studies, RASK, is in its second stage after completion of a decade, taking up a more contributory role on the study of Korea and Indo-Korea relations, attempting to be a well-grounded academic association.